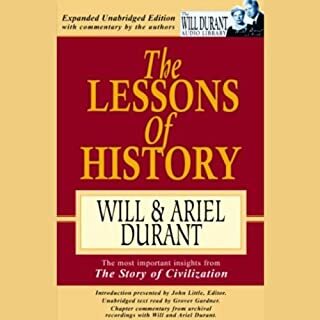 Will and Ariel Durant's books have graced my shelves all my life, admittedly collecting dust most of the time, until I needed some specific reference information. Regardless, I knew I could trust them to present historical information and context better than any website or encyclopedia. So when I saw this short book, I hesitated perhaps thirty seconds - a land speed record for a girl who tends to vacillate over everything. But I love history. I want to know everything that happened, everything we know. Which, of course, is impossible. This book is something of a miracle - the perfect combination of knowledge and wisdom. An exceedingly rare thing indeed. Then too, the recordings of Will and Ariel in interviews further elucudating their points... Brilliant and so endearing! For that reason I dare say this Audible edition is the best version of this book! And often I believe points can be lost in listening to complex and often abstract ideas. Not here. Not at all. 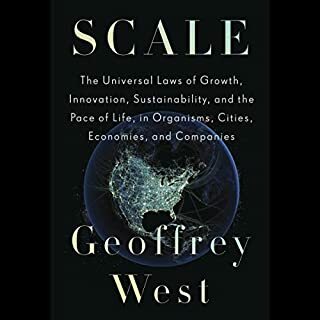 Accessible, intelligent, humble, and CRITICAL to the enduring success of our modern civilization, this book may be the MOST IMPORTANT BOOK I have EVER READ. And I have read some amazing works. So read this. Listen. Don't hesitate. Read it again, share it with...everybody. Require it in schools. Base government decisions on its guidance. I am serious. No exaggeration. The future of our world may well depend on grasping and initiating the ideas so generously shared by the Durants. Their contribution to their world can not be overstated. Initially, I was elated to find a brief news report by such a highly regarded publication as WSJ available with Audible membership for no extra cost. And I didn't hesitate for a second to add and listen to it. I am, however, deeply disappointed in the content provided, at least that of the March 21, 2019 program. 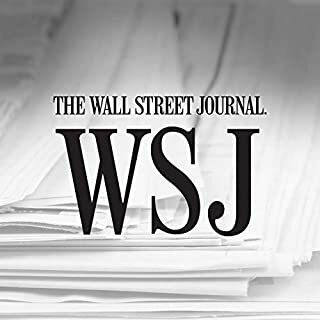 While WSJ covered several hot-button issues like immigration and proposed changes to the electoral college in the US, it spent an inordinate amount of time covering, not so much the New Zealand terrorism attack, but the shooter himself. Let me be clear that I am strongly biased on this topic as you may notice below, but I believe my stance is not without merit. When I was a journalism student, longer ago than I'd like to admit, I was taught that journalists never covered a suicide in depth. It was a question of ethics in journalism. An obituary was written, as it would be for anyone else, but the suicide aspect was never mentioned at all -- as it was thought to promote, or at least implant, the idea in other's heads. It gave validation to suicide ideation in people's minds. It gave attention to the person considering the act, and to an unstable mind, such attention could be appealing as I kind of glorification. Not only did it imply consent to such an act, it could even inadvertently encourage someone else who desired such notoriety to mimic. Journalists need a sense of ethics in reporting to the public: a responsibility for truth, but also for restraint. I feel it is the same with these mass shooters. In our insatiable curiosity and hunger for the sensational, we as humans tend to want to scrutinize the anomolous individual, the criminal, the psychopath, and find the differences in them from us. Its in our nature. Its also in our nature to judge those people with celebrity in whatever ways our own ethics -- or the ethics presented by media as popular opinion -- deem. For that reason, I stongly believe that our "news" reporters have a responsibilty to the public to present relevant, unbiased stories. However, that is not what I found in the first Audible story that I heard from WSJ. Yes, they presented some important news, and while they still do better than many news outlets, IMHO, as far as unbiased reporting goes, the simple fact that they delved into every detail of the Christchurch gunman's life, from everywhere he traveled to whether he left his kitchen clean before he made the choices he made, proves their bias. They were presenting news not as information but as thinly veiled sensationalism, a spectacle to engage a desensitized public. And if that behavior didn't have such high potential for inciting another individual with deranged thinking into violence for the sake of notoriety, then it wouldn't be so concerning. The thing is, they know better. Research shows that these incidents often follow closely on the heels of another. Words have power. The media, be it presented as fiction or nonfiction, has power. Journalists have power, whether they admit it or not. When they choose the angle of a story: details of a gunman's life, one-sided voices for gun-control, and so on, they can direct public opinion in ways I believe are highly unethical. I realize most other news agencies do the same, or even worse, but that doesn't make it any more acceptable. So yes, while the story of the gunman's every move could be viewed as thorough reporting, it could also be seen as sensationalism seeking ratings. And that is so very disappointing to me. I honestly expected WSJ to rise above. Will I continue to listen to WSJ's Audible presentations? For now, yes. Do I trust them as a fair, unbiased, and respectable journalistic institution? Not so much anymore. 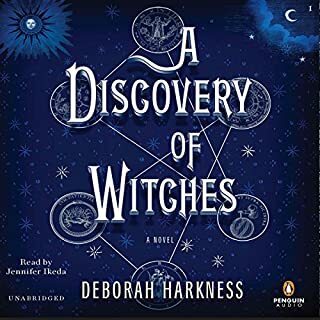 For years this book has been in my reading queue so I was happy to find an Audible version to make it a bit more accessible. The narrator is my only, rather minor, issue with this version. He is articulate and able to pronounce words and names that I have always fumbled with, making it easier to listen. But he also speaks slowly and without a lot of inflection. At times, it is too easy to tune him out as he drones a bit, making me have to relisten to sections sometimes. The other narrators confused me too, until I referenced the hard copy and realized they are reading the footnotes and other secondary texts. It helps once you have that context. I misunderstood their roles early on. 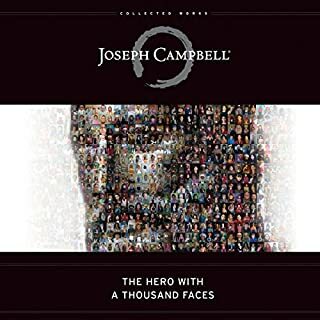 That said, Joseph Campbell truly did write a masterpiece on world mythology and humanity. It is dense at times, but the insights are worth having to re-listen to sections. I would recommend having a hard copy available, as this isn't the easiest book to fully grasp just by listening. In fact, I will be listening to it again soon, now that I have a better understanding of the larger picture Campbell was painting. I won't get into details you can find elsewhere, but will say, if you are a student of mythology, sociology, psychology, a writer, an artist, or just the curious sort, this book should be one of the first you pick up. You will never read or hear a story quite the same again. Fascinating topic that I am still curious about, but I just don't have the patience for this particular narrative/narrator. The narrator is articulate and enunciates carefully, but his tone felt... Well, snobbish and a bit patronizing to me. Mix that with a fairly dry read on universal scaling laws and you have what felt like a droll university prof droning on in front of a blackboard full of equations that you can't see. I imagine that this is a phenomenal read on paper, or at least, informative. On Audible? It's just dry. I have to rewind to relisten to some parts simply because they didn't process. Whether it's the scientific jargon on the work, the narraror's tone, or just my brain trying to multitask while listening to fairly detailed information, I don't know. But I finally gave up. When I realized I really needed to just start over to truly grasp what the author is trying to communicate, or read the hard copy, I decided to just let this one go. I rated the book with a neutral 3 for these reasons. My review is so subjective that I don't want to hurt the book's rating too much. Again, this isn't a "bad" book, but I can't say it's good either. At least for me, it was just too dry and the narrator actually irritated me enough that I was distracted from content. That said... To each their own. You may love it. Just listen to a sample first and ask yourself if you can listen to 19 hours of it. Thanks, Brené for a fantastic and thought-provoking performance. Some of these things sounded so much like me when I was younger, before I cared so much about conforming -- that person that didn't fit in, but didn't feel compelled to fake it either. I smothered that version of me after enough social fails, rejections, and humiliations. And I'm going to be trying to breathe her back to life, bit by bit, because I liked that me a whole lot better than the one trying so hard to fit in and be perfect. I suspect a lot of other people feel the same way. We've lost some things in our culture and just thrown other things away as unimportant. 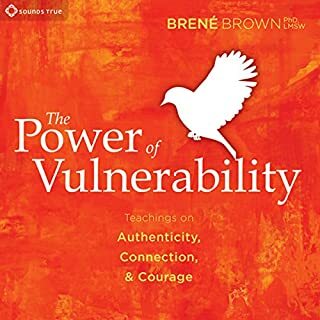 After listening to this, I don't even feel comfortable critiqueing this because so much of it included very personal and, yes, vulnerable anecdotes of Brené's, as well as her well researched work on shame, fear, and vulnerability. She goes places very few people are willing to even acknowledge, let alone talk about, with courage and character that is admirable and informative. Very rarely have I read a book that does not "make me think", but this one makes you really dig deep into your memory, experience, weaknesses, strengths, relationships, work, and play, and really consider how authentic you are being. How real are you being? Are you aiming to come off as the perfect mother, the perfect boss, the perfect whatever? Or are you really being and doing what you believe is right for you? How about for your kids? This "book" (which is actually a seminar) makes you gauge how courageous you really are. But it also gives you some tools to be more like the person you really want to be. It's forgiving when you screw up. It's supportive for the mistakes you will inevitably make, but mostly, it's encouraging. It's not too late to work on these aspects of your life and relationships. This is not a fixed set of behavioral prescriptions. She doesn't tell you, "say this. Don't say that"... Okay, maybe sometimes she does the latter, but not the way many self-help style authors do. Brené's approach is down to earth, endearingly flawed and completely accessible, and I would literally recommend this book to EVERYONE. It's that important for us to think about. I think this is the sort of topic that could change the world of enough people tried to integrate it into their lives. My husband and I listened to this book as we canned honeyed peaches and spiced preserves. Who'd have thought it would be such a curiously appropriate story for such an activity? We listened to the whole thing in one go (which is definitely the best way if you have the time) and I don't know if we've ever been so quiet in one another's presence. 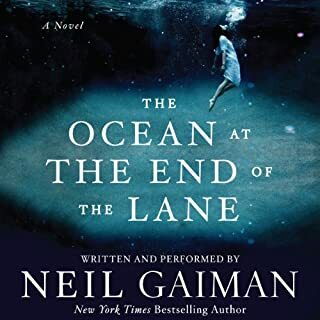 The story is, as per usual Neil Gaiman, strange and a bit meandering, never too clear and certainly never direct, but lovely and a little melancholy, the way fuzzy memories can be. It inspired a touch of nostalgia in me that I rarely experience in the fantasy genre. The boy, whose name I honestly don't think Neil ever gave, who narrated the story, experiences such a plethora of incongruent and otherworldly occurrences, his reality changed drastically from that of a mundane 7 year old in the country meeting a kind, older girl after a tragedy occurs in his life. She helps him, but he makes a grave, if very simple, mistake. And yet, as his world is twisted all askew by her family and what happens on their land, she sticks by him, protecting and guiding him. While he tries to navigate a magical world of insane adults and monsters that take their shape. The story isn't just about childhood or fantasy creatures, but about memory and experience, how time changes us, but especially our perception. It's about innocence and feeling lost in a world that seems to know so much more than you do, and is always just so impossibly big. It is about so much more than it seems. Which is exactly why it is so much fun. The author narrates it better than I think anyone else ever could, doing a great job with accents and dialects, tone and insinuation. This truly was a wonderful little story and one I will enjoy many times over. Thanks, Neil! Always insightful and accessible, Gladwell has produced yet another excellent work. 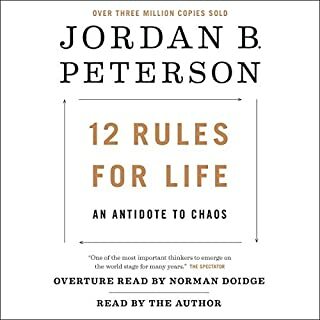 The author's writing style and narration in the Audible edition is ease to understand and engaging. The book itself looks at why certain ideas, brands, trends, etc catch on, while others do not. Who are the people who can convince so many to try something or to listen to them while ignoring others? How do they do it? Why do we follow their advice or example? While not a long read necessarily, it is fascinating and informative. 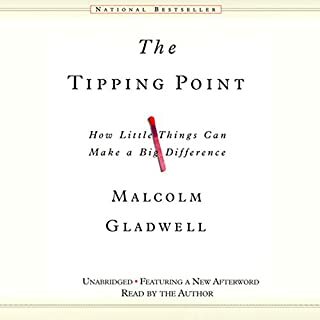 I'm definitely glad I picked it up, though after having read Gladwell's 'David and Goliath' I wasn't too worried about it being anything less than a five-star book.